The tournament season in Australia has just come to an end and that means that top players are preparing for the Masters tournament. It will take place in Melbourne this year and will be held by the end of November. I am glad I can also be included in the preparations, so not only I have a continuous opportunity to learn from Jeff but contribute to his preparations as well. The most interesting part, however, is that while I may be showcasing some variation of the army list Jeff is considering for taking today, I can almost guarantee that the army he will be playing with at the tournament is going to be different. Jeff tells me that he does not yet know himself what army he is going to take, so no worries, no secrets are revealed! I have not played against Night Stalkers for a very long time. I find them very unique, both in character and the way they play. I think their Mind Thirst rule is brilliant as it achieves something that is very difficult. 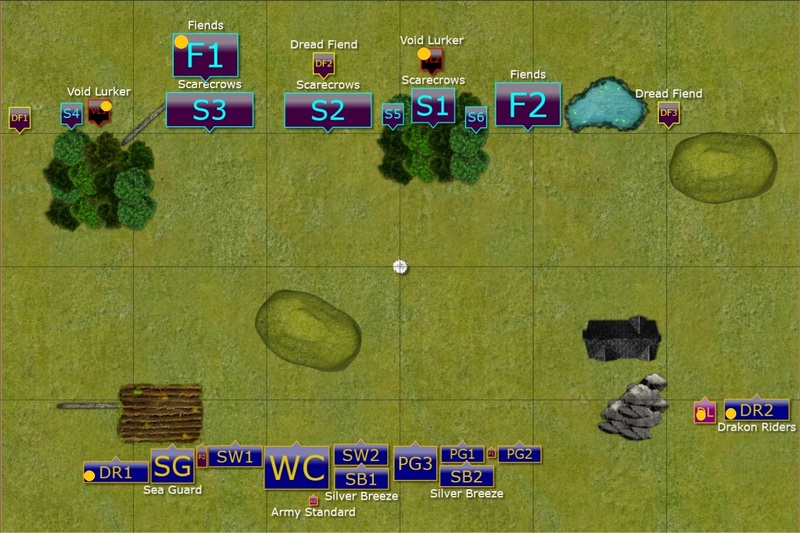 It encompasses the unique feel of the army with the game mechanics that encourages an approach different to other armies. It was thus no surprise that I was very curious what would be Jeff's take on this faction. First unit he picked, and that I have never played against before, is Scarecrows. They don't seem to look like a particularly dangerous unit. They are slow, seem to require a spell caster with Surge, they also have low defense of 3+ only. However, they are also very cheap and that means they can provide so much needed unit strength for the army. They are very reliable (cannot be wavered!) and one still needs to inflict certain amount of damage before they get routed. No wonder Jeff brought two hordes and the regiment to form the backbone of his army. Two more hordes of the Fiends added to the unit strength of the army but even more so provided fast and hard hitting units. Night Stalkers in general do not seem to have heavily armored units but combination of Stealthy and higher nerve makes up for it. It is definitely true for the Fiends. They can still be vulnerable to shooting if that can be properly focused on. While the Fiends are obviously dangerous, I considered three Nimble Dread-Fiends and two flying Void Lurkers much more difficult to contain. First, there are five very fast and very maneuverable elements that can attack individually or in teams. Anticipating the possibilities, especially in constantly changing situation on the battle field, is very difficult. Dread-Fiends have army wide Stealth to add to the protection from the shooting while Void Lurkers can count the regeneration. With their high nerve value they should be able to survive most of the attacks to start healing the wounds. To add variety to the army, Jeff included three Screamers to be able to fight back in the shooting phase. That added to the problems I would need to take care of. And while the Screamers may be the most vulnerable of all the elements in the army, it may not be easy to first single them out and then to deal enough damage to rout them. In general, I realized I have a quite difficult army to play against. It has advantage in staying power (as usual), it matches mine in speed and maneuverability and can inflict enough damage at the distance to start routing small units too. 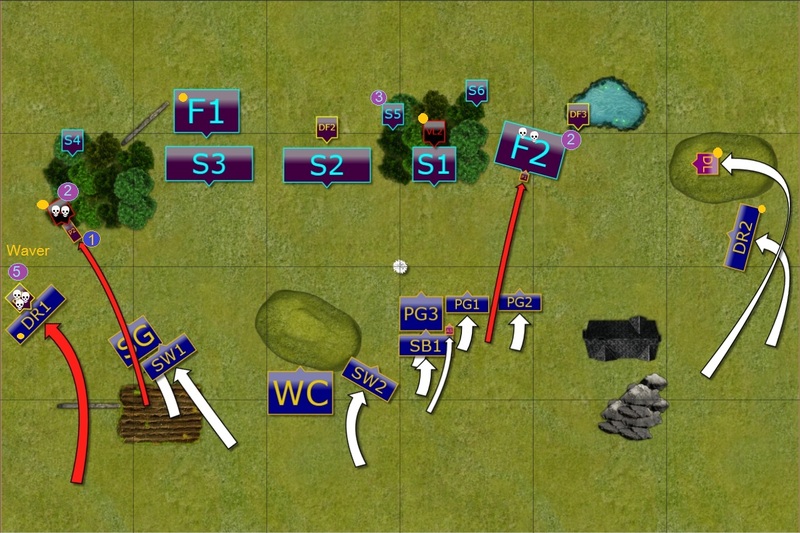 Deployment of the armies - markers indicate the most expensive units. We rolled Eliminate as a scenario and that meant that all Drakons Riders and Lord were marked in my army while Jeff had his Void Lurkers and one unit of Fiends nominated. It seemed that in both our respective forces the most maneuverable and hard hitting units were at the same time the ones that the opponent would try to hunt down. As I wanted to avoid early casualties, I decided to deploy beyond the range of the Screamers but still leaving me the option to move and shoot with my own units. I did not expect much from the turn 1 due to combination of penalties for Stealthy, cover and movement but every damage point may count in the later stages of the game. I had to make a decision as to what to choose as first target for the shooting and I chose Screamers. If I could at least waver them that would help me to maneuver and avoid lucky wavers in return. I also expected Void Lurkers and Fiends to be properly hidden anyway. Despite disadvantage in the combined unit strength of the army (22 vs 15) I thought I will fight in the middle to at least contest central objective. 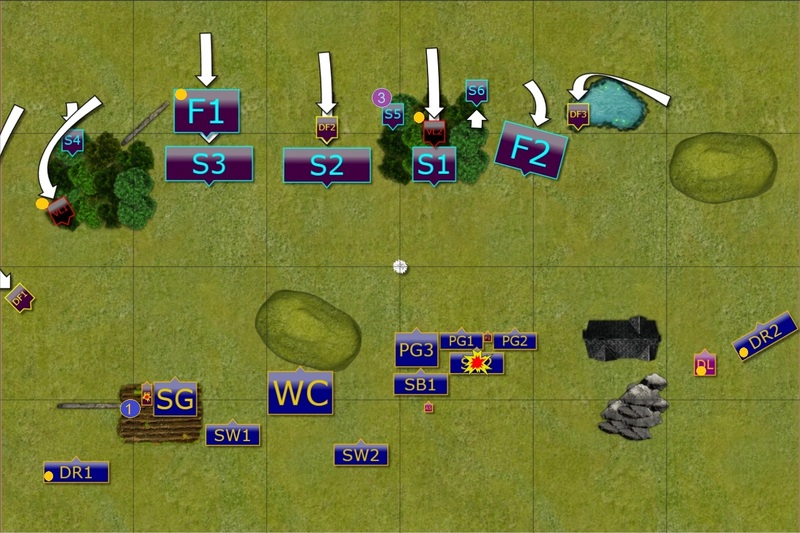 If that worked, I planned to use my mobile shooters to start adding wounds to any of the marked units and eventually rout it, either by shooting alone or with timely charge to finish the job. At the same time I had to make sure my Drakons survived the battle at all costs. I got the first turn this time. Let's see if my plan worked! 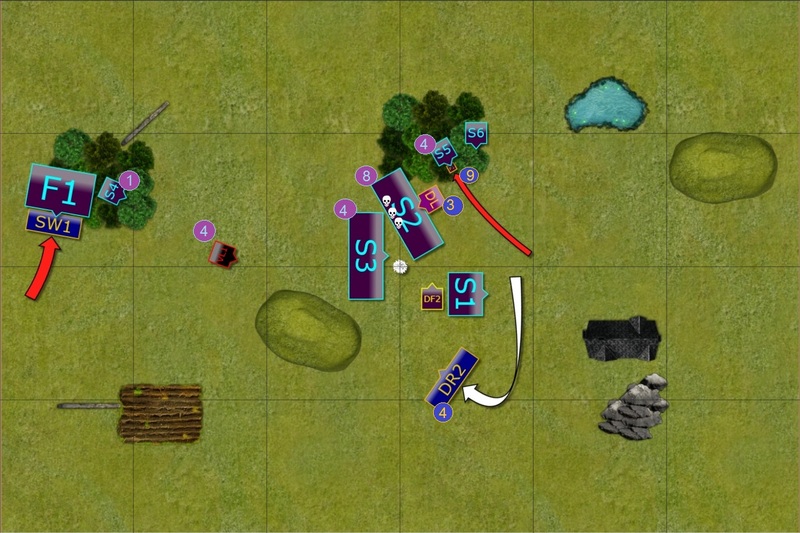 Elves tried to seize the initiative by moving towards the central objective. Palace Guard was chosen to do it and they advanced quickly, being closely supported by other units. Other elements maneuvered on the flanks, either to try and keep in check enemy forces or use the opening for a better outflanking maneuvers. Night Stalkers also moved forward with the majority of the forces. 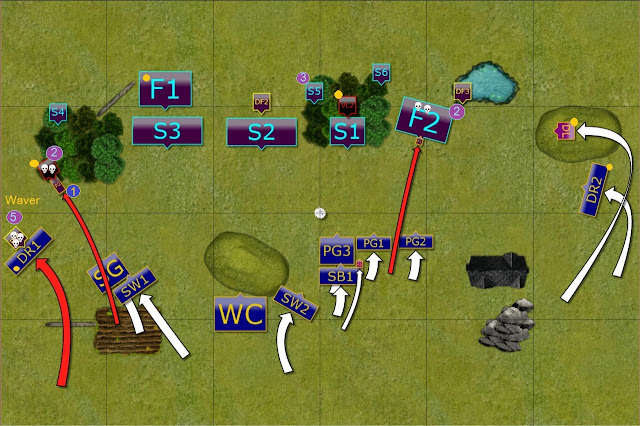 On the left flank the advance was spearheaded by Dread Fiend, while the units on the right flank converged towards the center instead. 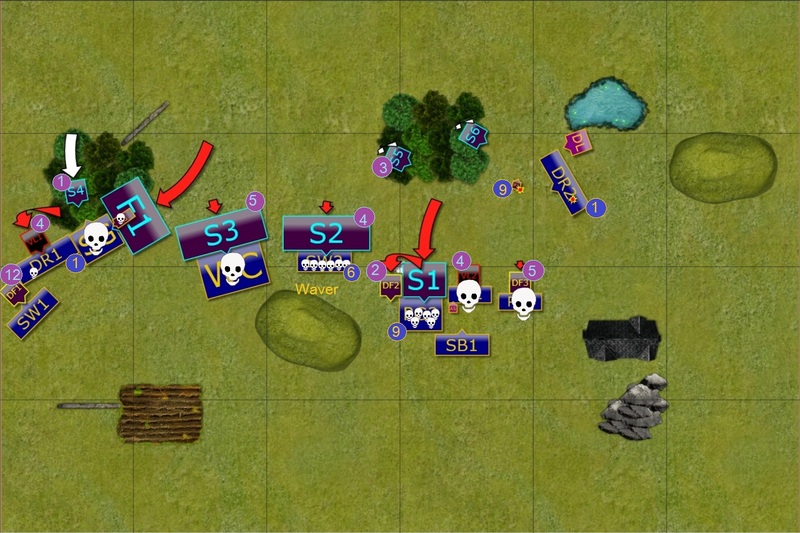 The Screamers noted a success by inflicting enough damage to rout Silver Breeze cavalry. Both Elven princes charged ahead of the army in order to intercept and distract the enemy. On the left, it was the Void Lurker and on the right it was the horde of Fiends. The aim was to allow the second wave of the Elven attack to move into place. On the left, the Drakon Riders also charged the Dread Fiend and managed to waver it. While on the right, the Drakon Riders and the Lord moved to threaten the flank. The Night Stalkers mounted a powerful counter attack, using their impressive maneuverability and speed to the fullest. All Palace Guard units were attacked and prevented from charging their chosen targets. Both Princes were badly wounded but somehow they both survived! That created some unexpected opportunities for the Elves but can they spot all the possibilities? 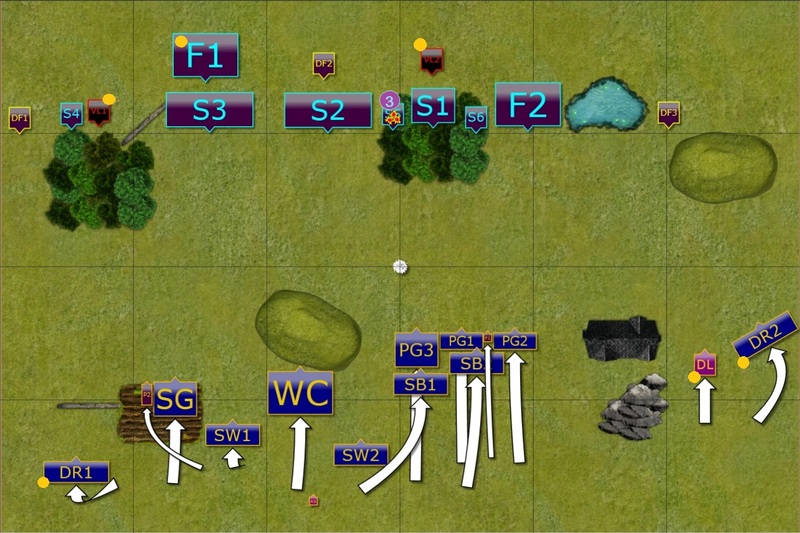 Elves attack on the entire length of the battle field. On the left Storm Wind cavalry badly wounded Dread Fiend but once again, it was wavered. The Drakon Riders and Sea Guard foolishly attacked Void Lurker in the forest. The attack was way too weak and the units were now vulnerable to counter charges. Both Chariots and Storm Wind cavalry in the center attacked Scarecrows to prevent them from joining the fight in the middle, while Palace Guard counter charged. 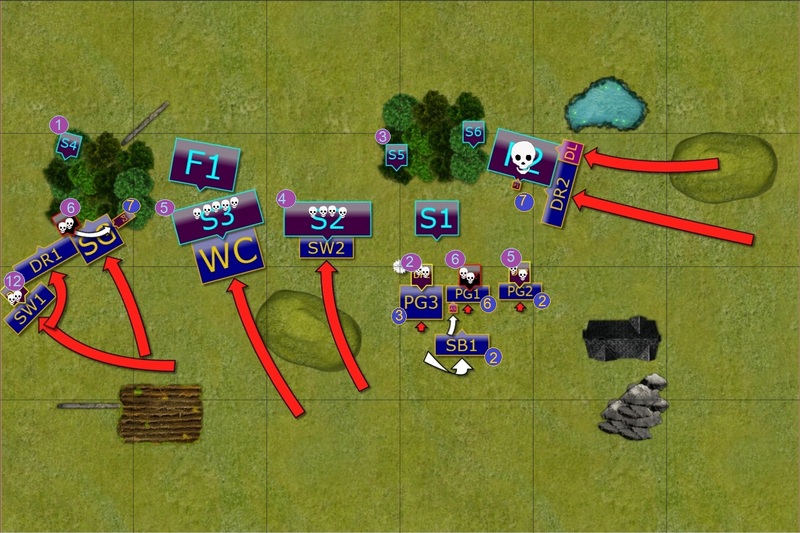 The main success for the Elven forces was on the right flank where Drakon Riders used the opportunity and managed to rout horde of Fiends. Elves committed their units in a reckless fashion and now it was time to pay the price. 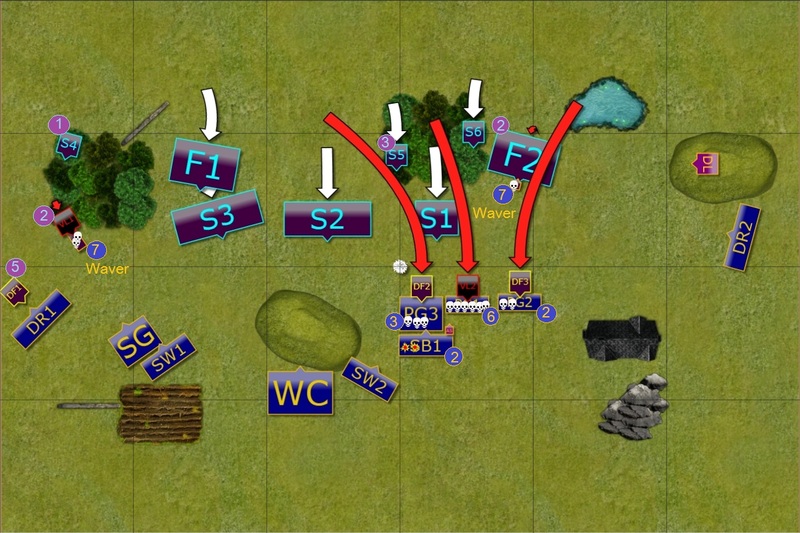 Powerful counter charges saw no less but four units gone! That was really bad news for the Elves but they kept fighting as hard as they could. 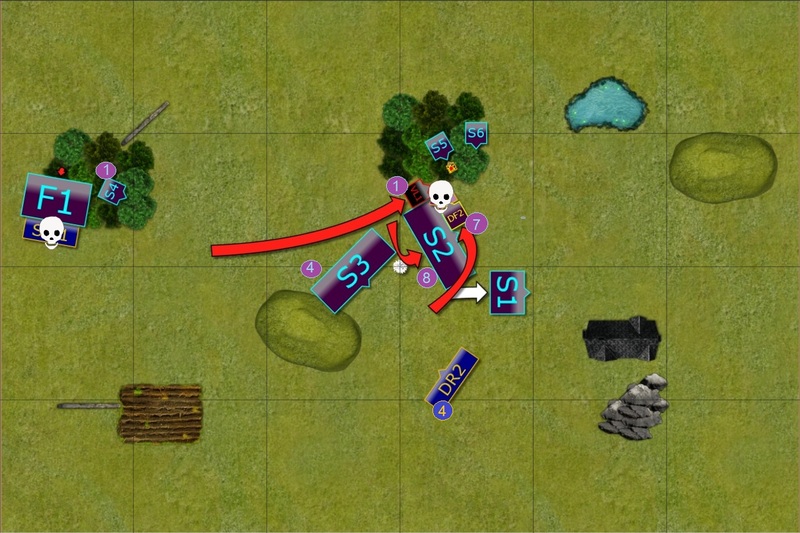 Although Elves sustained heavy losses, they managed to catch one of the Void Lurkers and attacked from three sides simultaneously. The attack from Silver Breeze tipped the balance and one Void Lurker was banished! On the left flank Storm Wind cavalry finally routed Dread Fiend and Drakon Riders wavered the second Void Lurker. The Fiends on the left attacked Drakon Riders but did not rout them for some reason. Scarecrows slowly were getting to the middle of the battle field while Screamers finished the job and routed remaining Palace Guard regiment. Elves were hard pressed indeed. Trying to break through the encirclement. With very few units remaining the options for Elves were quite limited. On the left, the Drakons blocked Storm Wind from joining the fight so they simply reformed to protect heavy cavalry. In the middle, Drakon Lord failed to rout the Screamer but Drakon Riders managed to destroy another Dread Fiend and regain some freedom. 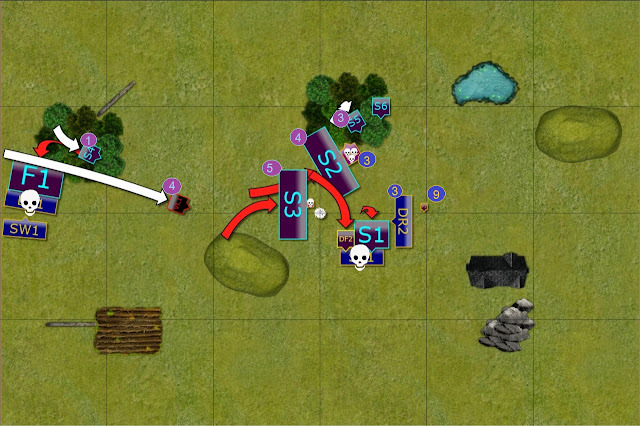 Night Stalkers regained the momentum and attacked again, punishing Elves for more mistakes. Drakon Lord was grounded and in no way to escape now. There was a little chance for Elves to try and swing the balance into their favor with one heroic act. 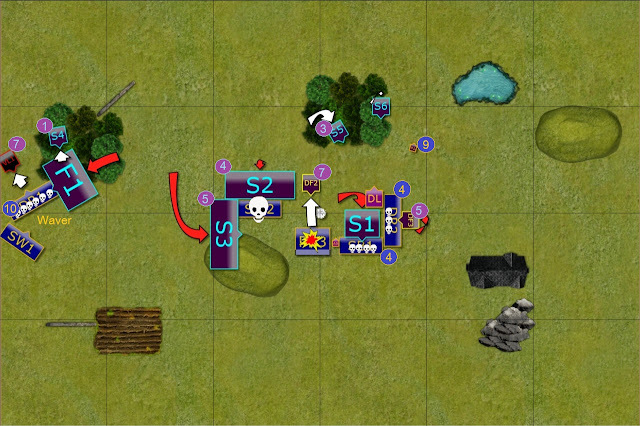 Unfortunately, Storm Wind cavalry did not hurt the Fiends to make that happen and it was clear that Elves lost. Drakon Lord paid the ultimate price for his folly and got captured by Night Stalkers. Of his fate no one dared to think of. Remaining Drakon Riders had to flee the battle to be the only survivors to tell the tale of the defeat. Many thanks to Jeff for another great game and congratulations for the victory! Just when I thought I may have a good opportunity to seize the initiative and gain an advantage, I made really stupid mistakes. First, I moved a bit too much forward with Palace Guard and got intercepted by Dread Fiends and Void Lurker. That was not the plan as I focused too much on being in range to attack Scarecrows and Fiends on the right. It turned out to give me some more options later, which I managed to use to great effect by routing Void Lurker and gaining some scenario points. But I wasted it immediately by committing Drakon Riders on the left in a completely unreasonable attack. What I should have done there was to either move the Drakons to the flank of the second Void Lurker (provided they would not be in its arc of sight) and attack it with Sea Guard to ground it. Sea Guard would expose the flank to the attack of the Fiends but I would have had many more options on that flank. And kept the Drakons alive. Second, the attack with Chariots was complete waste. I did not notice the opportunity to flank charge the Fiend fighting against Palace Guard regiment too. What a shame! Always a good chance and I may have blocked the Scarecrows more efficiently. Then more mistakes followed when I did not reform my Drakon Lord to face left instead of to the top. If I did I would have kept more options for attack and maneuver, perhaps helping Silver Breeze to get rid of the regiment of Scarecrows in the process or routing Dread Fiend instead. I think that even at that stage, i.e. turn 4 onward, I still had some options to carry the fight to the enemy where it matters. Instead, I got my units dragged into the fights they could not win. I also failed to use my shooting to any meaningful effect. It can do some damage, even against Stealthy Nights Stalkers, if I focused it properly on a single target. Any pictures of the Night Stalkers army? 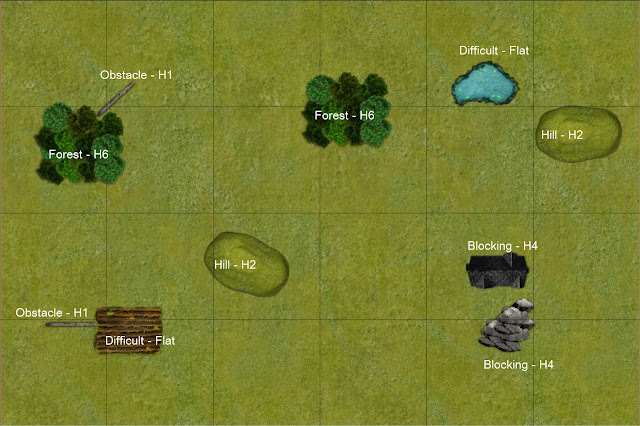 We played online on Universal Battle 2 so I am afraid no pictures of real models.